Spinach, or Spinacia oleracea, is a green leafy vegetable that is well known for its health benefits. It is available throughout the year. Spinach has a bitter and mildly sweet taste when raw, and boiling it on high heat for a minute (and draining it) can remove the acid content present in it to make it sweeter. Although it has been presented for ages as a remedy for iron deficiency anaemia, we now know that it contains non-haem iron which is not as easy for the body to absorb as haem iron found in meats. Spinach has alpha-lipoic acid, an antioxidant that can lower glucose levels, increase sensitivity to insulin and give some amount of relief from diabetes related symptoms such as burning, numbness and pain in the arms and legs. The antioxidants in spinach have another benefit of limiting the damage to blood vessels and hence reducing the risk of arteriosclerosis and high blood pressure. Peptides and potassium present in the vegetable also play a role in reducing high blood pressure. 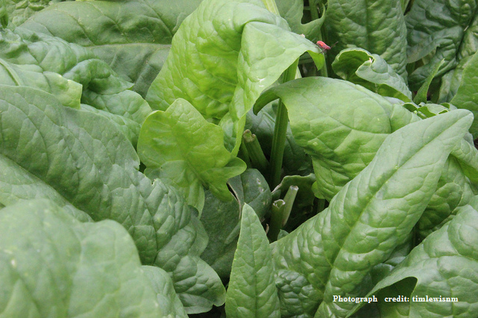 Spinach is a rich source of beta carotene which can prevent the occurrence of asthma. Lutein and zeaxanthin are carotenoids present in spinach in large quantities. These may possibly be effective in preventing age-related macular degeneration and cataracts. There are flavonoid compounds in spinach that are anti-inflammatory and that lessen the risk of cancer. Spinach provides vitamin K, calcium and magnesium which are vital for bone health. Vitamin K promotes calcium absorption too. High fibre and water content in spinach can prevent constipation and digestive problems. As a rich source of vitamins A and C, spinach contributes to healthy skin and hair. The high oxalate content in spinach can cause kidney stones in some people. Oxalic acid in spinach can interfere with the absorption of other important nutrients. These are the recipes of dishes cooked at the Goa Anglican Centre, a UK registered charity which hosts clergy and volunteers from time to time in Goa. Ingredients: 1 kg of beef (bhindi or undercut), 1½ - 2 tsp of ginger-garlic paste, 2 tbsp of vinegar, 1tbsp of oil, ½ a tsp of salt (or according to taste) and 1 tsp of sugar. Preparation: Stab the piece of beef lightly all over with a fork and marinate in a vinegar, ginger-garlic paste, sugar and salt mixture. Make sure the marinade is spread evenly all over the piece of meat. Leave it aside for half an hour. Then cook the whole piece of meat in a large vessel with oil, first on high heat (for 10-15 minutes) and then for an hour and a half on the lowest heat possible. Ingredients: 4-5 large potatoes, ¼ tsp of mustard seeds, ¼ cup of scraped coconut, 2 capsicum (bell peppers), half a cup of thick coconut milk, 1 tbsp of gram flour, 1½ tbsp of oil and salt to taste. Preparation: Heat the oil and let the mustard seeds split in the oil. Add peeled and chopped (medium size) potatoes. Fry them for about 5-10 minutes. Add chopped capsicum and stir them in. After 2-3 minutes add the gram flour and scraped coconut and salt. Stir till mixed well. Add the coconut milk and some water. Let it cook for 30 minutes before serving it as an accompaniment to the roast beef. A mixture of lime and honey in a glass of warm water is very useful in soothing a sore throat and reducing coughing. Cut a red onion into half and sprinkle a teaspoon of sugar over it and leave it overnight. The next morning there will be some liquid present in the vessel. The liquid can be taken for bad cough and is an expectorant.